The energy sources for man are drying up. The era of fossil fuels is going to end very soon. Scientists are now working on to find new renewable sources of energy. Along with renewable energy sources like light and wind comes gravity. Gravity is a phenomenon that existed from the very beginning of the universe but only discovered by Sir Isaac Newton not more than 400 years ago. Recently scientists started generating energy from gravity. The basic concept of a gravity power generating mechanism is simple. When a body goes down from a higher altitude to a lower one its potential energy is converted into kinetic energy via linear motion. This motion is converted circular motion and is then converted to electricity using a dynamo. One challenge in this mechanism is about getting continuous supply of energy. A body cannot go downward infinitely, but for continuous power generation this practically impossible scenario is necessary. 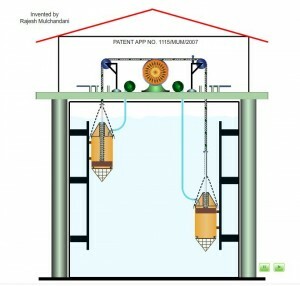 An interesting solution for this problem was invented by Mr. Rajesh Mulchandani and he has applied for patent. He uses gravity and buoyancy of water to generate a continuous up and down motion. The mechanism consists of a water filled tank with 50-60meters high with 2 balanced masses capable of moving using both buoyancy and gravity. You can see the full mechanism here http://powerfromgravity.com/invention.aspx. I have an idea how we can use gravity to generate electricity by observing existing technologies. How can we partner since you have the technical knowhow to actualize the project. We can build pure gravitation electric power stations for individual families all over the world thus leaving the national grids supplies for industrial use. We continue devastating dwindling marginal lands trees vegetation to fuel towns with coal. Highlands and mountains trees vegetation covers are dwindling to fuel rural homes. The gravitation power station will be more flexible in scaling up generation even from 3kw to 10kw which can meet power demand in a village. The earth 90% green cover destroyed at rural areas will recover and families will use electricity for domestic needs. Gravity can meet all electrical energy demand for everyone on earth and the earth environment will recover. This will revolutionize the energy power crises end and accelerates the doubling of the world economic growth. The build and tie up in technology will make gravity as the ideal source of electrical energy. The idea of using gravity for electricity production is revolutionary practical with present open technology available and the world has to provide resources required to actualize the projects. Gravity remains the ideal abundant potential of endless energy for electrical power stations for a healthy save environment on earth. We are blessed with the actual technical know-how to actualize the projects. i want to do this project as my project..please send me details,,, how can I make,,,, ???? Electricity generation is possible by gravity and buoyancy if you use proper mechanism but it cost 1.4 million USD per megawatt. You have to calculate volume of falling object (e.g.27 cubic meter or 953.50 cubic feet, density of object (<80), velocity 3 meter/second (9.84 feet/sec). you can get 97285 joule. Now deduct total drag( weight of belt or chain or wire rope, weight of flywheel, auxiliary power for other parts, power factor ) you can get 48642 joule net from kinetic energy, if you use height of 75 meters you can get kinetic energy of 6 object at same time, it mean 48642*6= 291855 joule =291.855kw. You can take object upward using buoyant force. This is not perpetual motion. When object enter from air to water you break perpetual and same happen when object move from water to air block. If you know proper mechanism to transfer object from air to water you can continuously generate electricity, from water to air movement no need too much energy or mechanism. If anyone want proper design feel free to ask me. If a power from windmill is generated by discontinous wind velocities, I hope this concept can also fetch us some results. I guess by coupling few number of water towers to the main power generator and these towers operating in synch with given time sequence can fetch us continuous power rate. But the number of towers to be coupled will be directly proportionate to height of each tower which would become crucial key cost factor for this. But if the same concept can be introduced in any natural water body with positive results, I hope this could provide some advantage. Please send me this project details to my email-id. Hi, there is an interesting way to convert gravity into kinetic energy just by building an over balanced mechanical wheel which would continuously keep rotating due to an amazing arrangement of falling weights attached to swinging levers inside the wheel. nice concept sir..plzz give me whole information/detail about this mechanism and also material used…..
Dear sir, I want to work on this project so please send me all the details,that would be grateful. sir would u plz send me the details about this project……plzz………. I had the same idea about this concept but instead of water I thought of using air-bouncy+magnetic poles to complete the concept. I have other imaginations for this idea. I would like to see yours working model practically. Sir,I want full detail of this project. ..
nice try ! concentrate on reducing the cost of the project and how to make it simple. I have been conducting experiments in the simillar way but my concepts are different from yours and they are yielding good result. keep it up. sir, i am a final year student of mechanical engg. sir i want to work on your project. so sir can you please send detail of this project with ppt file. sir i am final mechanical student i will do the poject this.pls send the detail about this project. I am a mechanical engineering student in my final year and have chosen your project theme for my final project, would you please be able to forward me any further information. sir iam having a doubt . How the pullys can be continuesily rotated , if one of the mass is brought up ,how that same mass can be brought down to get a continue flow current from dynamo. Please send me detail info of this projet. hi,i am a final yr mech. student .. i think i can choose ur project..
Can u plzzzz send me the ful article for this……. hi,i am a final yr mech. student . gonna do ma projects next sem ie.. from jan. onwards. i think i can choose ur project..